Anemia of CKD results from impaired production of erythropoietin, as well as from iron deficiency, blood loss, and reduced erythrocyte lifespan (1). In children with CKD, anemia reduces health-related quality of life by contributing to fatigue, depression, sleep disturbance, impaired cognition, loss of appetite, and decreased exercise tolerance (2). Treatment for anemia in patients with CKD includes iron therapy and erythropoiesis-stimulating agents (ESAs) (3). Continuous erythropoietin receptor activator–methoxy polyethylene glycol-epoetin beta (C.E.R.A.) is a continuous erythropoietin receptor activator with a longer t1/2 compared with other ESAs such as epoetin beta, epoetin alfa, and darbepoetin, allowing for once-monthly/4-weekly dosing with stable hemoglobin levels (4,5). C.E.R.A. is indicated for the treatment of anemia associated with CKD in adult patients on dialysis and not on dialysis, and is administered intravenously or subcutaneously (6,7). Trials in adults with CKD on dialysis showed that hemoglobin levels were maintained to a similar extent in patients who switched to C.E.R.A. (intravenous or subcutaneous) every 4 weeks, or who continued receiving epoetin injections up to three times weekly (8,9). When switching adult patients from shorter-acting ESAs, the starting dose of C.E.R.A. is on the basis of the dose of the previous ESA (6,7). There are currently limited data on the efficacy and safety of C.E.R.A. in pediatric patients, with two small studies reporting attainment of target hemoglobin levels without adverse drug reactions (10,11). This study was undertaken to determine the conversion factor that allows switching from other ESAs to C.E.R.A. administered intravenously in pediatric patients with CKD with anemia, undergoing hemodialysis. A secondary objective was to document the efficacy and long-term safety of C.E.R.A. in these patients. The Dose Finding Trial of Pediatrics on Hemodialysis in Nephrology (DOLPHIN) was a phase II, open-label, multicenter, multiple-dose study conducted at 28 sites in ten countries (Clinicaltrials.gov identifier NCT00717366, registered on July 16, 2008), designed to identify a conversion factor for switching to C.E.R.A. from other ESAs in pediatric patients with CKD and anemia. The primary end point was the change from baseline in hemoglobin concentration 16–20 weeks after switching. The study was conducted in accordance with the Declaration of Helsinki and Good Clinical Practice. The protocol and amendments were approved by local institutional review boards or ethics committees. Written informed consent from the parent or legal guardian and/or the child, if required by national legislation, was provided before any patient underwent any study procedures. All patients at participating centers aged 5–17 years, with body wt ≥10.0 kg, with stable chronic anemia of CKD under ESA treatment, who had been undergoing hemodialysis for ≥8 weeks were eligible. A mean baseline hemoglobin between 10.0 and 12.0 g/dl was required as determined from two weekly hemoglobin values measured during screening (weeks −2 to −1). Patients were required to have adequate iron status, defined as serum ferritin ≥100 ng/ml, transferrin saturation ≥20%, or <10% hypochromic red cells, and to have been receiving stable maintenance treatment with intravenous darbepoetin alfa, epoetin alfa, or epoetin beta with the same dosing interval for at least 8 weeks, and no weekly dose change ≥25% (increase or decrease) during screening. Patients were excluded if they had overt gastrointestinal bleeding or had received a red blood cell transfusion within 8 weeks, previous or current red cell aplasia, hemoglobinopathies or hemolysis, chronic inflammatory disease, uncontrolled hypertension, severe hyperparathyroidism (intact parathyroid hormone ≥1000 pg/ml or whole parathyroid hormone ≥500 pg/ml), biopsy-proven bone marrow fibrosis, epileptic seizures within 3 months, or active malignant disease. The study included a 20-week core phase, consisting of a 2-week screening period, a 16-week dose titration period, and a 4-week evaluation period, followed by an optional 52-week safety extension. Patients were switched from other intravenous ESAs to intravenous C.E.R.A., scheduled every 4 weeks at a starting dose determined by previous dosing of darbepoetin or epoetin alfa/beta. C.E.R.A. was provided in single-use, prefilled syringes at different concentrations (30–200 μg/0.3 ml and 360 μg/0.6 ml). Patients were given the calculated dose and unused C.E.R.A. was discarded. 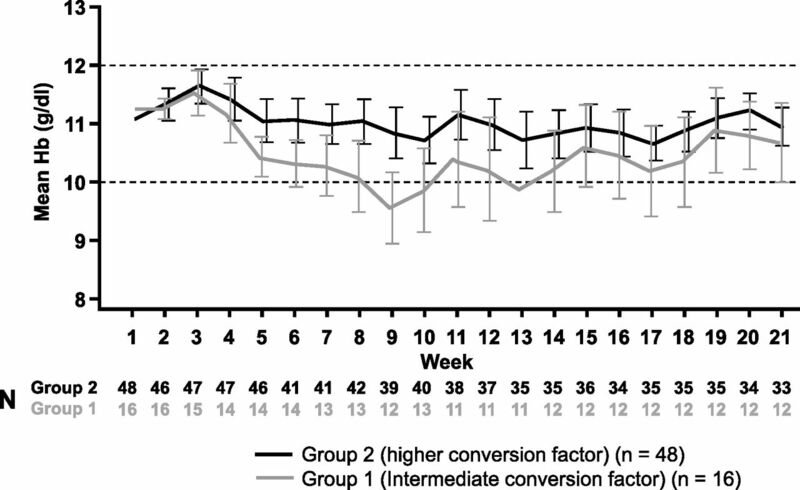 Two conversion factors were tested sequentially. In group 1 (intermediate conversion factor, first 16 patients) the starting dose was 4 μg every 4 weeks for each weekly dose of 250 IU epoetin alfa/beta or 1.1 μg darbepoetin. After the first 16 patients had completed at least 16 weeks of treatment, a preliminary assessment of efficacy and safety was conducted, as part of which the uncorrected 90% confidence interval (95% CI) for the average change in hemoglobin concentration from baseline to weeks 14–16 was calculated using the same methodology as for the primary end point. This analysis showed that the lower limit of the 95% CI for average change in hemoglobin concentration was <−1.0 g/dl, and a second group with a higher conversion factor was tested. 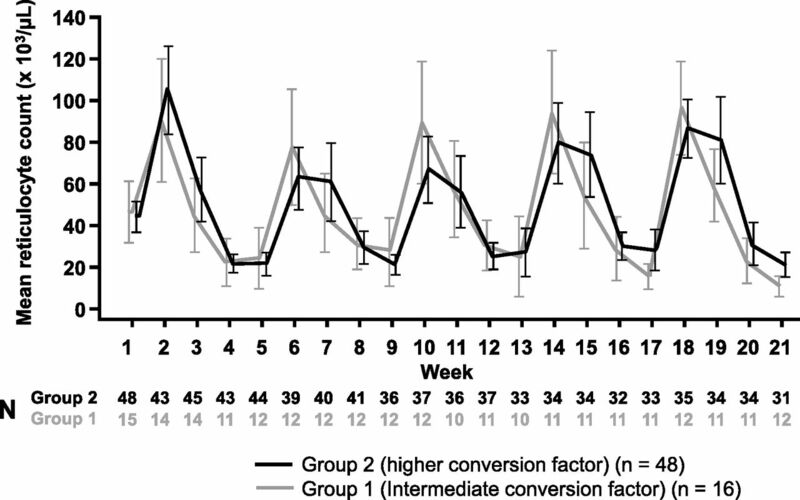 In this group (group 2, higher conversion factor) the starting dose was doubled to 4 μg every 4 weeks for each weekly dose of 125 IU epoetin alfa/beta or 0.55 μg darbepoetin, so that a patient receiving 6000 IU weekly epoetin alfa-beta received a 4-weekly C.E.R.A. dose of 6000/125×4=192 μg and a patient receiving 20 μg/wk darbepoetin would receive a 4-weekly C.E.R.A. dose of 20/0.55×4=145 μg). After preliminary assessment of the first 16 patients in group 2, the conversion factor was considered appropriate and a total of 48 patients were recruited to this group. All blood samples were taken on the same day of the week, before C.E.R.A. administration and before hemodialysis. Samples were to be taken on the day of hemodialysis after the first short interdialytic interval for patients undergoing fewer than seven sessions per week (e.g., at the second session of the week for patients undergoing three sessions per week). The dose of C.E.R.A. could be adjusted at any time to maintain a patient’s hemoglobin concentration within a target range of ±1.0 g/dl of their baseline hemoglobin and between 10.0 and 12.0 g/dl. Dose adjustments were made on scheduled dosing days and were on the basis of the previous hemoglobin value measured within 1 week of the scheduled dose (the dosing interval was never to be <4 weeks). The dose of C.E.R.A. was increased by 25% if hemoglobin showed a decrease of >1.0 g/dl over baseline or if hemoglobin was <10.0 g/dl and ≥9.0 g/dl. The dose was increased by 50% if hemoglobin was <9.0 g/dl. The dose of C.E.R.A. was decreased by 25% if hemoglobin showed an increase of >1.0 g/dl over baseline or was approaching 12.0 g/dl. If hemoglobin exceeded 12.0 g/dl after a dose reduction, C.E.R.A. was withheld until hemoglobin fell below 12.0 g/dl and was then resumed at a dose reduced by 25%. Patients from both groups who completed 20 weeks of treatment with a hemoglobin concentration within ±1.0 g/dl of their baseline value, and within the target range of 10.0–12.0 g/dl, were eligible to enter an optional 52-week safety extension period, during which patients continued to receive C.E.R.A. once every 4 weeks, with hemoglobin concentration measurements at 4-week intervals. Adverse events were reported by the investigator and classified according to the Medical Dictionary for Regulatory activities v18.1. Events were recorded as possibly/probably related to study drug or as unrelated, according to the opinion of the investigator. This was an exploratory study without a powered statistical group comparison. The primary end point (change from baseline in hemoglobin concentration 16–20 weeks after switching) was calculated on a per-patient basis, using an area under the curve approach to calculate an individual’s average for both the baseline and evaluation periods (weeks 16–20). Descriptive statistics of the primary end point were calculated. In addition, baseline covariate-adjusted estimates of the change from baseline in hemoglobin concentration and corresponding 95% CIs were calculated from an analysis of covariance model. The model contains the patient’s baseline hemoglobin as a covariate and includes dependent effects for dose group, age group, and previous ESA group. The primary analysis was on the basis of the intention-to-treat population, defined as all patients enrolled. Secondary efficacy end points were the number of patients with an average hemoglobin concentration within ±1 g/dl of baseline during the evaluation period; the number of patients with a hemoglobin concentration above, within, or below the range of 10–12 g/dl during the evaluation period; the incidence of red blood cell transfusions; and changes in reticulocyte counts. All efficacy and safety outcomes were calculated on the basis of available data, with no imputation for missing values. A total of 112 patients were screened between July of 2008 and June of 2015. 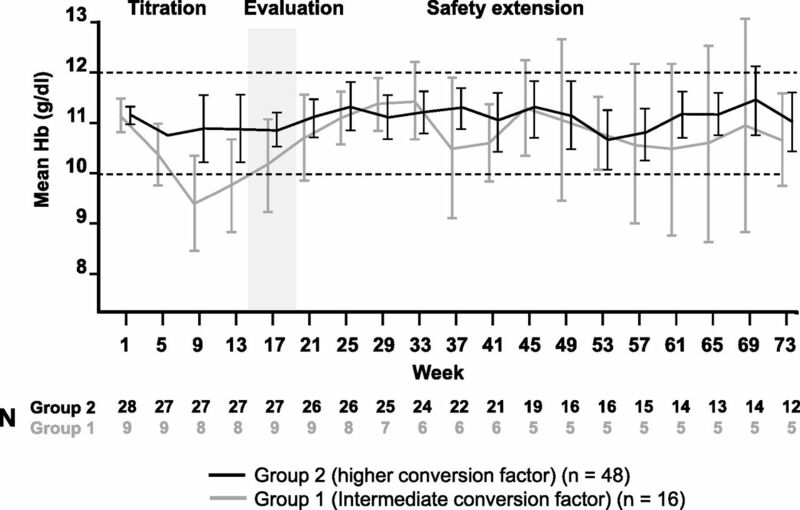 Of these, 64 were enrolled and received at least one dose of study drug: 16 initially in the intermediate conversion factor group (group 1) and 48 in the high conversion factor group (group 2). Reasons for screening failure were predialysis hemoglobin levels outside 10.0–12.0 g/dl (n=30), unstable ESA doses before screening (n=4), poorly controlled hypertension (n=4), no signed informed consent (n=3), inadequate hemodialysis (n=2), severe hypoparathyroidism (n=2), inadequate iron status (n=1), gastrointestinal bleeding (n=1), and high likelihood of transplant (n=1). The first patient was enrolled on July 28, 2008 and the last patient visit was conducted on March 29, 2016. Forty-seven patients completed the core period. Seventeen patients withdrew from treatment prematurely: four out of 16 (25%) in the intermediate-factor group and 13 out of 48 (27%) in the higher-factor group (Figure 1). Most withdrawals (13 out of 17) were for kidney transplantation. Of the other four withdrawals, one was due to a liver transplant, one patient moved to another hospital, one died of an intracranial hematoma unrelated to treatment, and one refused treatment. Thirty-seven patients entered the safety extension (nine from the intermediate-factor group and 28 from the higher-factor group) and 17 completed 73 weeks of treatment. Of 20 withdrawals during the extension, 16 were for kidney transplantation. Two withdrew for administrative reasons because of issues with the dialysis center and two withdrew consent. Baseline characteristics are presented in Table 1. Overall, a majority of patients were boys (34 out of 64, 53%) and most were white (46 out of 64, 72%), the mean age was 12.6±3.2 years, with the youngest aged 6 years, and the median duration of treatment with an ESA was 1.3 years (interquartile range, 0.5–3.1) (Table 1). Three patients in the intermediate-factor group and one in the higher-factor group were diagnosed with FSGS, but none were actively nephrotic. Two of the patients with this diagnosis (one from the intermediate-factor group and one from the higher-factor group) withdrew for kidney transplant after one and two doses, respectively. At baseline, the mean hemoglobin concentration was 11.1 g/dl in the higher-factor group and 11.3 g/dl in the intermediate-factor group (Table 1). During the core period, mean hemoglobin in the higher-factor group was maintained within the target range (10.0–12.0 g/dl) at all time points, whereas mean hemoglobin dropped below 10.0 g/dl at several time points during the core period in the intermediate-factor group, reaching a nadir at week 9 (Figure 2). In the primary analysis, estimated mean per-patient change in hemoglobin concentration from baseline to evaluation period, from an analysis of covariance model adjusting for age group, previous ESA type, and baseline hemoglobin, was −0.09 g/dl (95% CI, −0.45 to 0.26) in the higher-factor group and −0.74 g/dl (95% CI, −1.32 to −0.16) in the intermediate-factor group. During the evaluation period, more patients in the higher-factor group (27 out of 36, 75%) than in the intermediate-factor group (seven out of 12, 58%) maintained hemoglobin values within ±1.0 g/dl of baseline. Similarly, more patients in the higher-factor group (29 out of 36, 81%) than in the intermediate-factor group (nine out of 12, 75%) maintained hemoglobin concentrations within the target range of 10.0–12.0 g/dl. There was no evidence for differences in hemoglobin levels between patients aged 6–11 years and in those aged 12–17 years, or between patients switched from epoetin alfa/beta or darbepoetin (Figure 3). In both groups reticulocyte counts showed a cyclic variation as would be expected, with 4-weekly peaks and troughs corresponding to the timing of C.E.R.A. administration (Figure 4). Patients in the higher-factor group tended to develop a slightly longer reticulocyte stimulation and higher predosing reticulocyte counts after four to five injections. However, there was no overall tendency for reticulocytes either to increase or decrease over the course of the study. During the 20-week core period, the majority of patients in both groups, 37 (77%) in the higher-factor group and 13 (81%) in the intermediate-factor group, required dose modifications. In the higher-factor group, 14 (29%) had dose increases, five (10%) had dose decreases, and 18 (38%) had both. In the intermediate-factor group, nine (56%) had dose increases, two (13%) had dose decreases, and two (13%) had both. On a patient-by-patient basis, changes in C.E.R.A. dose between the initial dose and the evaluation period in the higher-factor group were very small. The median dose ratio (each patient’s dose during the evaluation period divided by their initial dose) in the higher-factor group was 1.00 (interquartile range, 0.66–1.52), whereas in the intermediate-factor group it was 1.59 (interquartile range, 1.19–2.47) (Table 2). In the higher-factor group, the dose decreased slightly up to the fourth dose and then increased for the fifth and final dose at week 17. These changes reflect the small increase in hemoglobin at the start of the study. Although there was no consistent pattern of difference in dose ratio in subgroups according to previous ESA, the median dose ratio in the younger age group was higher in both the intermediate- and higher-factor groups (Table 2). The median 4-weekly dose of C.E.R.A. during the evaluation period, adjusted for body weight, was 3.2 µg/kg in the higher-factor group (interquartile range, 2.3–5.1) and 2.3 µg/kg in the intermediate-factor group (interquartile range, 1.5–3.3). For patients with hemoglobin within the target range (10.0–12.0 g/dl and within ±1.0 g/dl of baseline) during the evaluation period who entered the extension period, mean hemoglobin concentrations remained within the target range in both groups (Figure 5). Twenty patients remained in the study for at least 1 year and total exposure was 45 patient-exposure years. However, most patients did not complete 73 weeks of treatment, with the main reason for withdrawal being kidney transplant. Efficacy end points were assessed when a patient exited the study rather than at the end of the extension period, to ensure information was as complete as possible. Overall, 70% of patients (26 out of 37) had a hemoglobin concentration within the range of 10.0–12.0 g/dl at the last observation in the study, and 62% (23 out of 37) of patients had values that were within ±1.0 g/dl of the baseline value. Among patients from the higher-factor group who entered the extension period, the median weight-adjusted dose of C.E.R.A. was 2.5 µg/kg in patients aged 6–11 years (interquartile range, 2.2–2.7) and 2.4 µg/kg in the 12–17 years group (interquartile range, 1.9–4.0). The overall pattern of reported adverse events was similar to that observed in studies in adult patients, with no new safety signal detected. The incidence of adverse events and serious adverse events is presented in Table 3. During the core period, 49 patients (77%) experienced one or more adverse event, 16 (25%) experienced a total of 25 serious adverse events, and one patient died because of intracranial hematoma after a fall (unrelated to treatment). No other patients discontinued or required dose modification due to an adverse event. Two serious adverse events (arteriovenous fistula thrombosis and thrombosis in device) were considered related to treatment. During the extension period, 27 patients (73%) experienced one or more adverse event and nine (24%) experienced a total of 12 serious adverse events, none of which was considered to be related to treatment. The most common adverse events were headache (14%), nasopharyngitis (14%), and hypertension (13%) during the core period, and nasopharyngitis (19%), headache (16%), and hypertension (14%) during the extension period. Serious adverse events in more than one patient during the core period included device-related infection (n=3, 5%), bronchitis (n=2, 3%), arteriovenous fistula thrombosis (n=2, 3%), thrombosis in device (n=2, 3%), procedural hemorrhage (n=2, 3%), fluid overload (n=2, 3%), and hypertension (n=2, 3%). Hypertension (n=2, 5%) was the only serious adverse event reported in more than one patient during the extension period. One serious adverse event of arteriovenous fistula thrombosis resulted in surgical thrombectomy whereas the other thrombotic events resolved without sequelae. At baseline, 32 patients (50%) had hypertension and 37 (58%) were receiving/had received antihypertensive treatment. During the core period, hypertension was reported as an adverse event in eight patients, seven of whom had preexisting hypertension and one of whom had previously received antihypertensive treatment, although this patient was not reported to have hypertension at enrollment. During the extension period hypertension was reported as an adverse event in five patients, one of whom had experienced hypertension during the core period. Vascular access thrombosis occurred in one patient in the intermediate-factor group and three in the higher-factor group during the core period (one patient experienced two events), none of whom had hemoglobin >12.0 g/dl. The events (all serious) included arteriovenous fistula thrombosis (two patients) and thrombosis in device (two patients). Three patients experienced five thrombosis events during the extension period, including arteriovenous fistula thrombosis (two events) and thrombosis in device (three events). Three were serious adverse events. Three patients (two in the higher-factor group and one in the intermediate-factor group) required blood transfusions during the core period. No patients developed antidrug antibodies or pure red cell aplasia. Although C.E.R.A. is approved for treatment of anemia of CKD in adult patients on dialysis and not on dialysis (6,7), there has been a lack of safety and efficacy information in pediatric patients. This has been mainly because of logistic challenges in patient recruitment and retention in this setting. In this study, we succeeded in establishing a conversion factor allowing safe switching of children and adolescents from epoetin alfa/beta or darbepoetin to C.E.R.A. To arrive at this goal, 64 patients were recruited over 7 years in ten countries, highlighting recruitment challenges in the pediatric dialysis population. 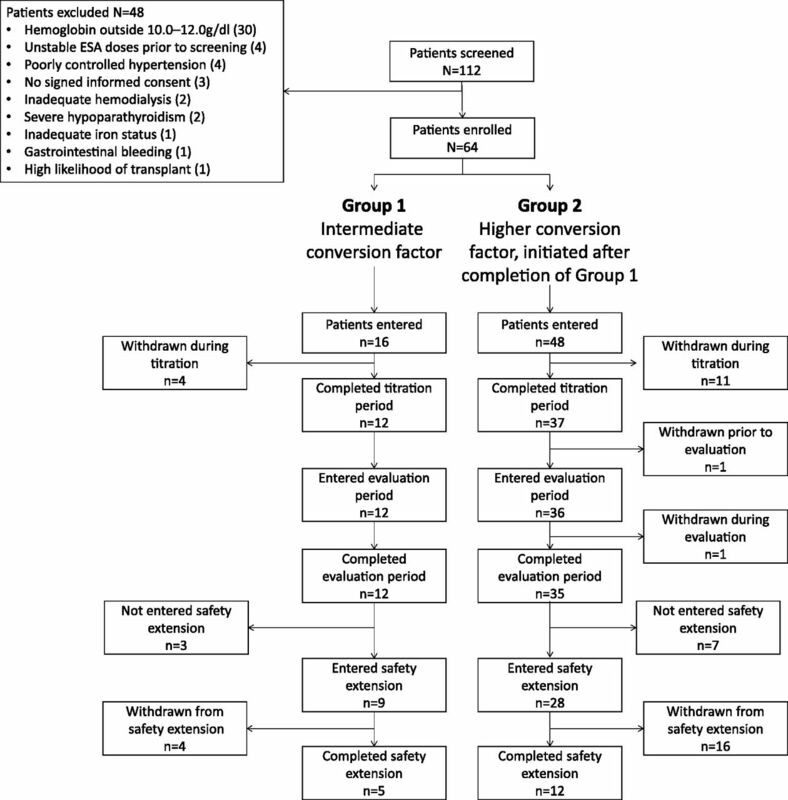 In addition, 20% of children during the core study period and 43% during the extension withdrew for kidney transplantation, even though those with a planned transplant within 16 weeks were excluded from participation in the study. Nevertheless, this study provides important information on the efficacy and safety of C.E.R.A. in the pediatric hemodialysis setting. The results of this trial demonstrate that, when using a defined conversion factor for switching from maintenance treatment with darbepoetin or epoetin alfa/beta followed by standard titration algorithms to achieve hemoglobin levels within a target range, C.E.R.A. is efficacious in maintaining stable hemoglobin levels in pediatric patients with CKD-associated anemia undergoing hemodialysis. The conversion factor used in group 1, the intermediate-factor group (4 μg every 4 weeks for each weekly dose of 250 IU epoetin alfa/beta or 1.1 μg darbepoetin) was directly derived from experience with adults receiving C.E.R.A. intravenously and from the results of a published study of darbepoetin alfa in pediatric patients (12). As the patients included in this study were already on stable maintenance doses of an ESA before conversion to C.E.R.A., and assuming a linear relationship across dose ranges, the use of a conversion factor resulted in a C.E.R.A. dose that was proportional to the previous ESA dose, thus correcting for the higher weight-adjusted dose requirements in pediatric patients. However, the dose appeared too low to maintain adequate hemoglobin concentrations, and therefore a higher conversion factor (4 μg every 4 weeks for each weekly dose of 125 IU epoetin alfa/beta or 0.55 μg darbepoetin) was evaluated in group 2. Hemoglobin levels were well maintained in the higher-factor group. The adjusted mean change in hemoglobin concentration between baseline and the evaluation period, the primary efficacy end point, was negligible (−0.09 g/dl). After switching from maintenance ESA therapy to C.E.R.A., and appropriate dose titration, mean hemoglobin concentration in the higher-factor group remained within the target range of 10.0–12.0 g/dl throughout the core and extension periods. Moreover, in the higher-factor group, 75% of patients maintained hemoglobin within ±1.0 g/dl of baseline and 81% maintained hemoglobin within 10.0–12.0 g/dl. These data are comparable with what has previously been reported for switching between ESAs. In 124 pediatric patients receiving recombinant human erythropoietin randomized to switch to darbepoetin alfa or continue to receive recombinant human erythropoietin, 75% of switched patients maintained hemoglobin within a target range (10.0–12.5 g/dl) compared with 73% of patients who continued to receive erythropoietin (12). The results were consistent in subgroup analyses in pediatric patients aged 6–11 years and 12–17 years, and regardless of whether previous maintenance therapy had been performed with darbepoetin alfa or epoetin alfa/beta. Although most patients underwent dose modifications during the core period, the median dose applied during the evaluation period was very similar to the starting dose in the higher-factor group. In the younger age cohort, however, the median dose in the evaluation period was 25% higher than the starting dose. 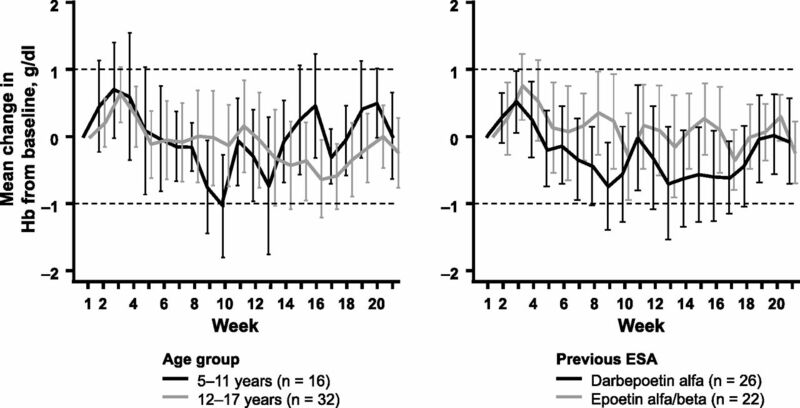 This suggests that, on average, pediatric patients in this younger age group who switch to C.E.R.A. using the defined conversion factor are likely to require the equivalent of one dose adjustment by 25% during dose titration. The efficacy and safety of C.E.R.A. observed in this trial are consistent with those obtained in previous studies in adults (5,8), and with the established safety profile obtained over many years of routine use in adults with CKD. In children, two small studies of C.E.R.A. in 16 pediatric patients on peritoneal dialysis (median dose 1.6 µg/kg every 2 weeks, subcutaneously) (10) and 12 pediatric patients after transplantation (median dose 2.5 µg/kg monthly, intravenously) (11) have reported attainment of target hemoglobin levels and no adverse drug reactions. On the basis of our results, patients aged 6–17 years with stable hemoglobin receiving darbepoetin alfa or epoetin alfa/beta can be switched to C.E.R.A. at a dose corresponding to 4 μg every 4 weeks for each 125 IU epoetin alfa/beta or 0.55 μg darbepoetin. The adverse event profile observed during the core period was consistent with that reported in previous studies in adults. Exposure to C.E.R.A. for up to 73 weeks did not reveal any unexpected or new safety issues. The most common adverse events in children were nasopharyngitis, headache, and hypertension. During the core and extension period hypertension was reported as an adverse event in 13%, a low incidence for this population of pediatric patients undergoing hemodialysis, where a cross-sectional study has reported hypertension prevalence of 79% (13). Interestingly, Washida et al. (14) have reported lowered BP in patients switched from darbepoetin to C.E.R.A., although this will require further investigation. Although patients younger than 5 years were not eligible for this study, another study to determine the optimal starting dose of C.E.R.A given subcutaneously for the maintenance treatment of anemia in pediatric patients aged 3 months to 17 years, with CKD, on dialysis or not yet on dialysis, is currently in the planning stages. In conclusion, pediatric patients with CKD and anemia undergoing hemodialysis can be safely and effectively switched from weekly maintenance treatment with epoetin alfa/beta or darbepoetin to 4-weekly intravenous injections of C.E.R.A., using the conversion factor defined in this study. M.F. discloses consultancy and honoraria for Fresenius Medical Care. F.S. discloses consultancy for F. Hoffmann-la Roche Ltd., Bayer, Amgen, AbbVie, Alexion, and Otsuka; research funding from Fresenius Medical Care; honoraria from Alexion; and scientific advisory board activities for Alexion and Otsuka. S.C.M.R. and Z.M. are employees of F. Hoffmann-La Roche Ltd. E.W. has no conflicts to disclose. We would like to thank the patients, their families, the nurses, and the investigators who participated in this study. Z.M. and S.C.M.R. analyzed the data. Z.M., S.C.M.R., M.F., E.W., and F.S. interpreted the data. All authors reviewed and revised the manuscript and approved the final version for submission. This research was funded by F. Hoffmann-La Roche Ltd. Support for third-party writing assistance for this manuscript, furnished by Blair Jarvis and John Carron of Health Interactions Ltd., was provided by F. Hoffmann-La Roche Ltd., Basel, Switzerland. Data from this study have previously been presented at the Annual Meeting of the American Society of Nephrology (Kidney Week), Nov 15–20 2016, Chicago, IL and the Triennial Congress of the International Pediatric Nephrology Association, September 20–24 2016, Iguacu, Brazil. A full list of investigators is provided in the Supplemental Appendix. This article contains supplemental material online at http://cjasn.asnjournals.org/lookup/suppl/doi:10.2215/CJN.03570417/-/DCSupplemental.